A fantastic romantic wedding portrait is what every bride is looking for us to create. 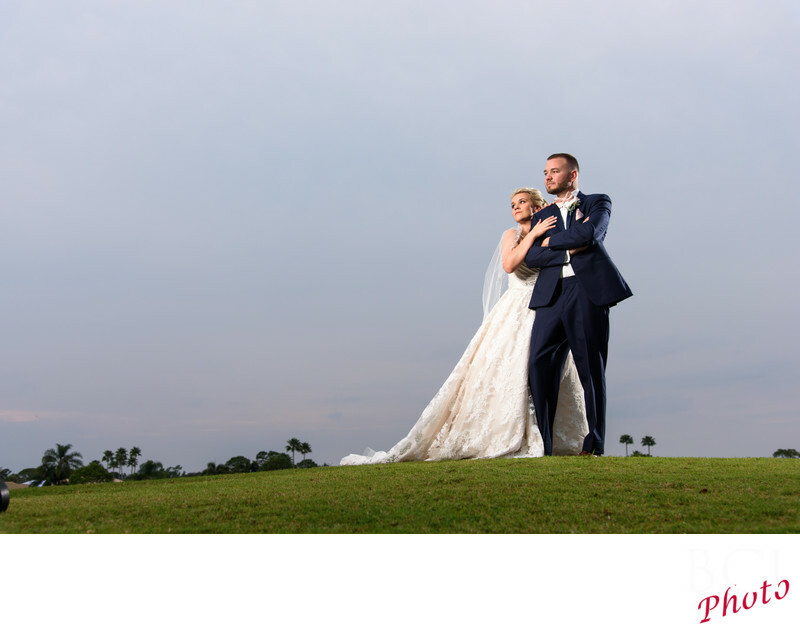 We love the low angle here which created a super clean sky only background, and also eliminated the somewhat cluttered look of the homes on the other side of the hill. Another point often lost, is that every shot need not have the couple looking into the camera lens. In fact we prefer it that way. Ideally, they will either be looking at each other, or as in this shot, into the frame which draws the viewer into the shot and creates a sense of wonder at what they might actually be staring at. We also love the physical connection between them. Often neglected, that physical contact with the hands really ties the couple together and is something often overlooked by wedding photographers during these romantic wedding photo sessions that typically are rushed by the wedding planners and dj's who just dont realize the importance of this 30 minute block of time (if that).